I needed a week to recover from this one. 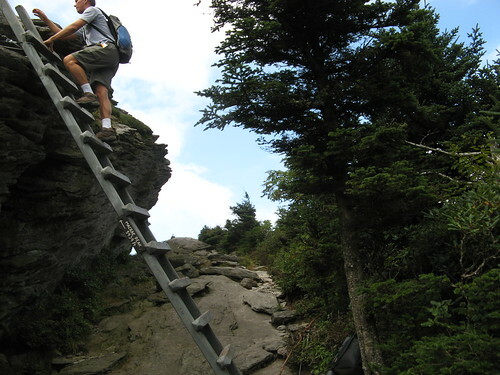 The Grandfather Trail along the summit ridge at Grandfather Mountain State Park is a crazy obstacle course of ladders, cable routes and 50-ton boulders. Strong hikers can do all the trails between the Mile-High Swinging Bridge and Calloway Peak in a day, I suppose, but the rest of us have to settle for saner outings like the one I did last Saturday. This is my second try at these trails. 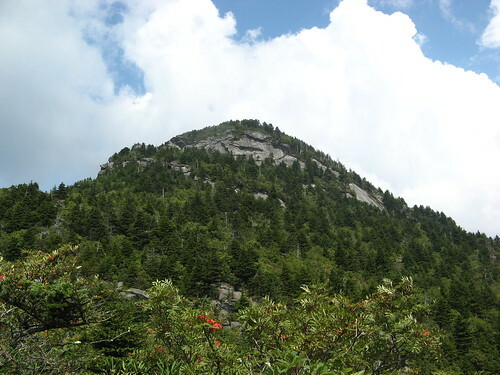 The first took me to the Swinging Bridge and MacRae Peak; this time I decided to skip the bridge (mostly) and see if I could manage the Calloway Peak out-and-back in one outing. Not hardly. It was another of those four-miles-in-six-hours days. (See why I have to hike solo? Banana slugs make better time). After revisiting MacRae Peak, I navigated a boulder zone and scrambled up The Chute to a cool cut between the rocks called Attic Window. From there I headed downhill, passing a fine campground called Alpine Meadow. I turned back about three hours in, when my GPS receiver informed me I’d covered a whopping 1.9 miles. I guess I should not have waited till way down here to mention it was a perfect day for a hike and I brought home some of my best pictures in months. 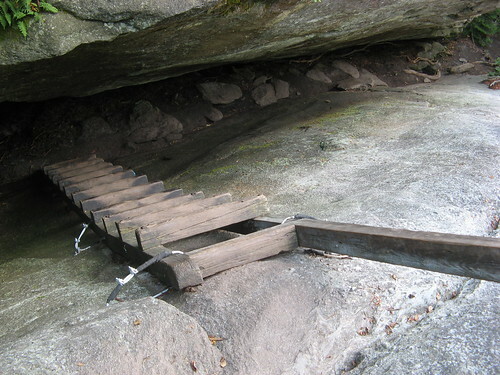 Then again I don’t want anybody thinking Grandfather Trail is a pleasant stroll. Invigorating, awe-inspiring and occasionally terrifying (depending on your issues with heights) describe it about right. If this blog post helps make up your mind about checking it out, you can’t say you weren’t warned. What say we look at some pictures? 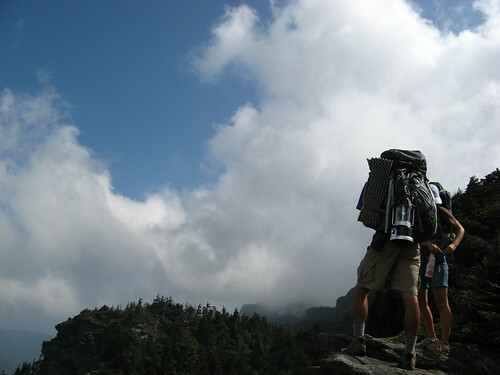 That’s MacRae Peak — the hike up there is a great test of your own nerve, and your shoes’ tread. Excellent outcrop on Grandfather Trail. Here’s where it starts to get interesting. 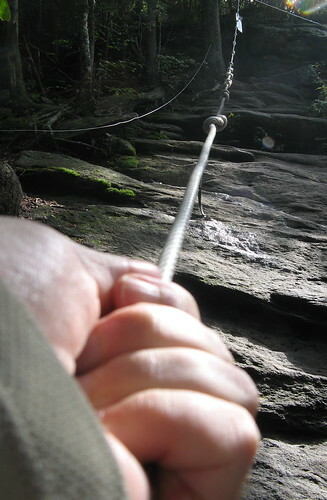 After Grandfather Gap, the trail turns right and comes to this rocky section where you grab this cable to make your way up. Sweaty hands increase the fun factor. The fun continues with this ladder up between a gap in the rocks. This is looking down after I’d climbed the ladder. The ladder-to-the-sky vibe is priceless. Came across a bunch of young backpackers, including this guy carrying a whole lantern. Don’t think he’d been reading up on his ultra-light principles. This great big dark chunk of rock is the actual summit of MacRae Peak. 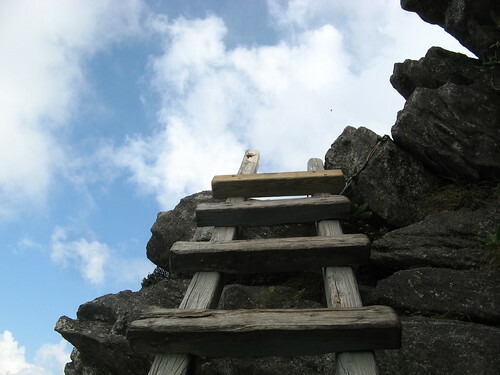 Yet another ladder goes up to MacRae Peak. 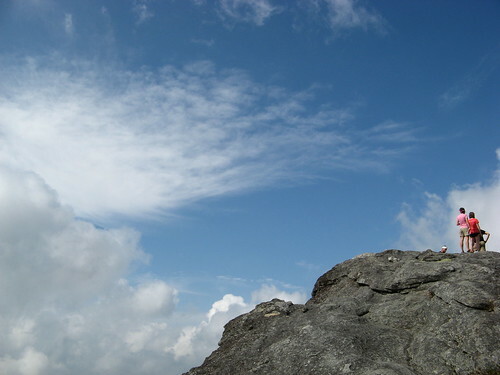 Finally got some cool sky on one of my hikes. 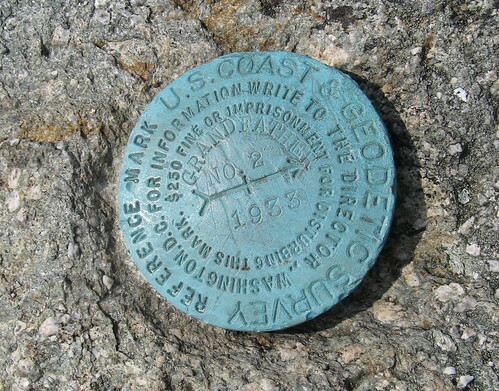 Summit marker, placed in 1933. Must’ve been real fun to get up here back then. This is where I’m headed next. 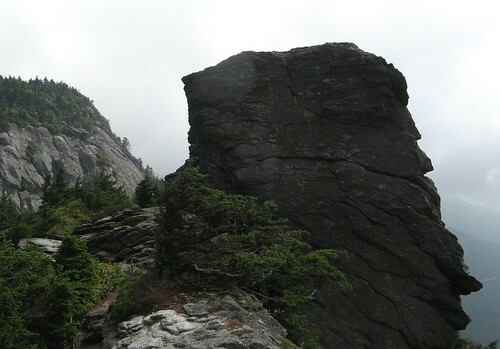 A cleft in the rock is faintly visible on the left side of the knob. The trail climbs pretty much straight up it via The Chute. 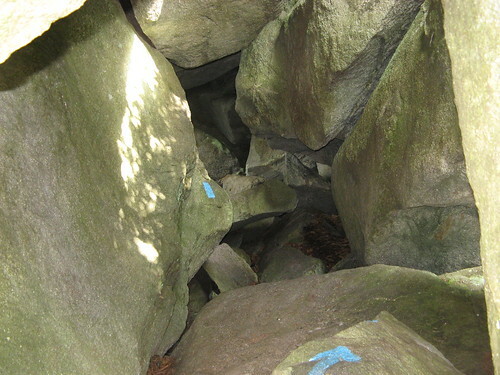 Before you get there, though, you have to follow the trail through the middle of this pile of boulders. A group of teens navigating The Chute. They were practicing for their big Grand Canyon adventure next spring. I wonder if the Grand Canyon has any trails this severe. Not sure how far I made it past Attic Window; all I know is the campground at Alpine Meadow is a nice place to break for lunch, if you didn’t mind the flies. 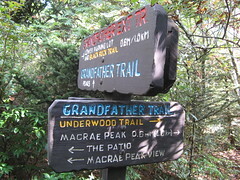 I followed Grandfather Trail back to MacRae Gap, the took a right on the Underwood Trail, which rejoins the Grandfather Trail near Grandfather Gap. Underwood is shady and downhill, but it’s a boulder field most of the way, so it’s not exactly a respite. If you stay on Grandfather Trail long enough, you eventually reach a break in the trees where the new Top Shop is visible. The famed Swinging Bridge is over to the right. One more look at the Blue Ridge Mountains from the summit parking lot. 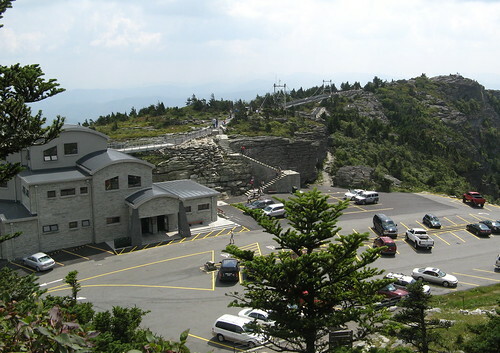 It costs $15 a head to enter Grandfather Mountain at the main entrance. 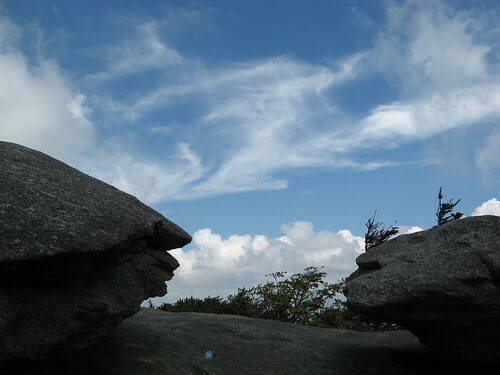 You can hike in for free from the Blue Ridge Parkway at Mile 299.5, and from the Profile Trail on the west side of the mountain. 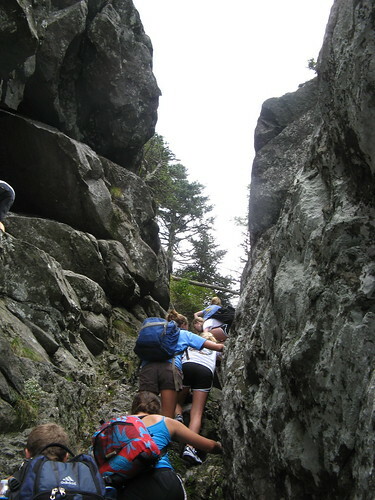 Don’t be lured by the free entrances unless you’re in really good physical condition — the hike to Grandfather Trail is wicked enough; any hiking on the actual trail will double the exertion. After you’ve paid the fee, drive to the Black Rock Parking Area and park there if you’re planning to hike. Don’t start your hike from the summit lot next to the Swinging Bridge. 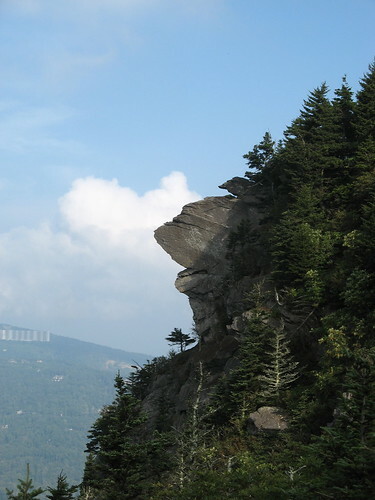 All my Grandfather Mountain hikes. 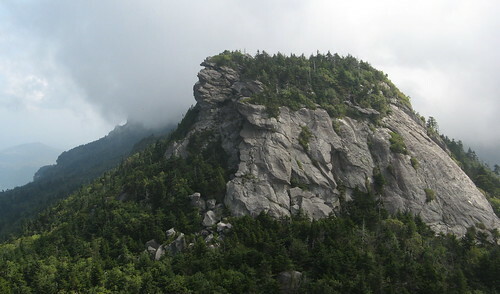 Grandfather Mountain is beautiful this time of year. 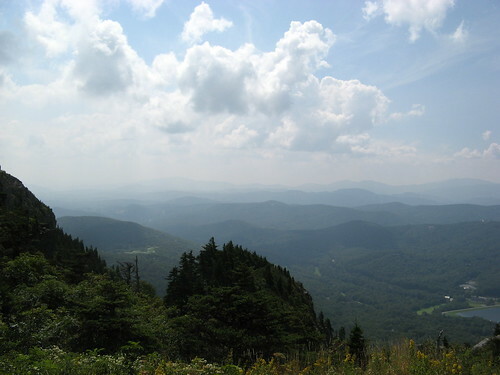 Do you go into Pisgah National Forest very often? Sliding Rock is tons of fun in the summer. Dennis: I haven’t done Pisgah so far but I’ll check out Sliding Rock. Amazing stuff. I had no idea there were hikes like this anywhere. How high was the cable climb? Matt: The cables are around 5800 feet I think. That sounds like sooo much fun. I go hiking and roller skating with my dogs out here in florida, but I would love to find a serious trail like that. If you have any advice for me I would love to hear it. 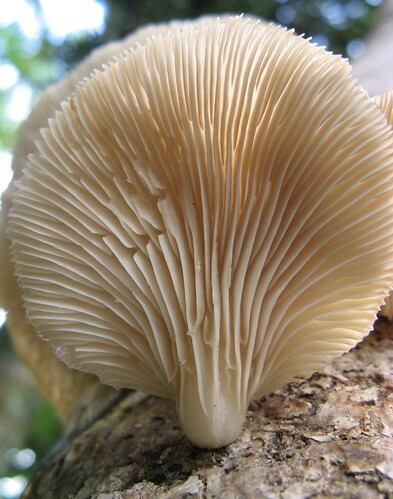 Those pictures are simply amazing! I live in NH with the Presidential range, which doesn’t have anything as severe as that trail. We do have some nice views if you are ever in the area though!